Two free evenings of music are offered next week by Paris Junior College. 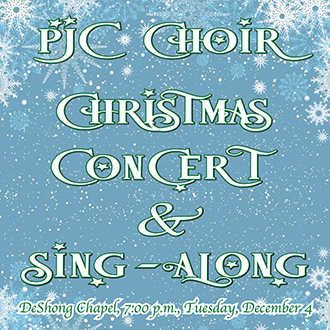 A student recital will be held Monday at 7 p.m., Dec. 3, 2018, and a Christmas Concert and Sing-Along is featured for Tuesday at 7 p.m., Dec. 4, 2018. Some of the songs to be performed at the Christmas concert include “Still, still, still;” “Deck the Halls;” “God Rest Ye Merry Gentlemen;” “O Come, All Ye Faithful;” “The First Noel;” “Coventry Carol;” “In dulci jubilo;” “Gloucestershire Wassail;” “Wassail Song;” “Lo, How a Rose E’er Blooming;” “O Tannenbaum;” ... and more.